Solid brass Georgian door knobs on backplate, supplied in pairs with follower bar and fixings. 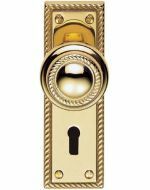 Door knob diameter 54mm, backplate, for lock and bathroom set 6 x 2inch (152 x 51mm). Picture shows the Lock Plate Knob.